San Francisco homeless advocates gathered at City Hall today to express discontent with how the city has handled days on end of unusually poor air quality. Speakers argued that, in the face of a public health “crisis,” city government has been remiss in taking care of its most vulnerable population: the homeless. 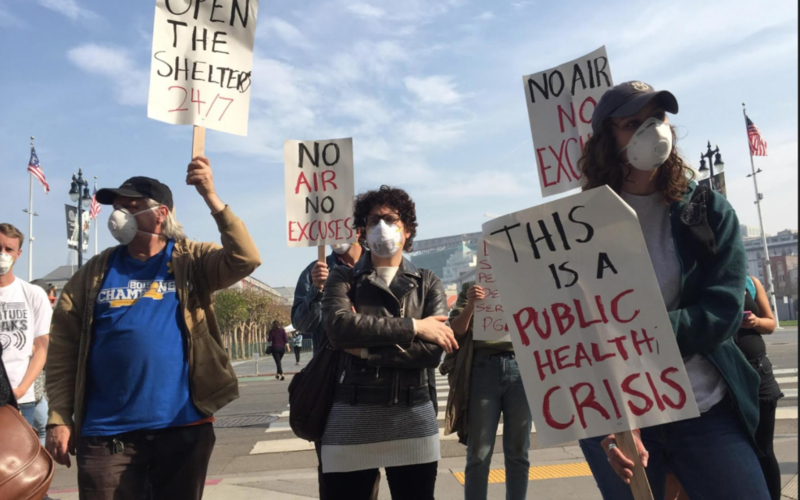 “The city has not adequately responded to getting our unhoused people — and people in general — masks for their lungs, or 24/7 shelter,” said Jackie Fielder, one of the event’s organizers and a member of DSA, through a bullhorn on the City Hall steps. While the city has made an effort to pass out masks to homeless individuals — the Department of Homelessness and Supportive Housing says it had distributed 1,623 masks to street population as of Saturday — the coalition of protesters Monday afternoon said it was not nearly enough, and the city should open the shelters during the day when they are typically closed. Randy Quezada, a spokesman with the Department of Homelessness, said that the Homeless Outreach Team has been performing wellness checks, offering masks, water and transport to shelter and drop-in centers — and will continue to do so as outdoor conditions remain substandard. To date, he said, more than 1,600 masks and about 700 bottles of water have been distributed. Of the city’s 1,203 traditional shelter beds, 85 percent are located at sites that are open all day, he said, and all of the City’s Navigation Center beds are available 24 hours per day. Six of eight family sites are open 24 hours. But Coalition on Homeless volunteer Nicholas Kimura announced over the bullhorn that the city’s largest shelter MSC South, which contains 340 beds and 75 emergency beds, had just Monday opened during the day for those needing refuge from poor air quality. He noted that some shelters still boot people at 7 a.m. and only allow them to come back at 3 p.m., or in some cases, 7 p.m.
“Unfortunately, this action was not done soon enough,” Kimura said. “When the air quality was the worst the city had seen — and when it was the worst in the world — people were still forced outside, people were still sleeping outside during the day. Dale Smith, a DSA member, said that he and fellow members have distributed 2,800 masks to people throughout the city, with a special focus on the homeless population, and his group to distribute 3,700 more over the next couple days — including 1,000 that they will ship to his “comrades” to distribute in the North Bay. Tyson, a homeless man, was sitting outside the library shortly before the rally. He was not wearing a facemask. He had a surgical mask on hand and said he used it when doing more physical activity. People distributing masks had offered him one in the last couple days, he said, but he turned them down. He did not know whether the couple was volunteering or with the city, but he said he would gladly take a mask now. Another homeless woman sitting on the Civic Center lawn said that people who looked like “young city employees” gave her a mask in the last few days when she was in front of the library. She said police officers had checked in on her another unhoused individuals. Government officials have praised city efforts over the past week. Questions directed at the Department of Homelessness and Supportive Housing about why it has disseminated far fewer masks than private individuals have not yet been answered. PreviousElection 2018: SF voters just kicked the YIMBYS right in their backyards. Where do things go from here? From what I’ve read in these few articles, it sounds like most of the homeless offered masks didn’t really take or use them. Given that a lot of these folks are abusing their bodies to an extreme (smoking, drugs, alcohol), breathing in the air (I believe I read one day Is equivalent to 11 cigarettes) probably won’t have an incrementally large affect on their health. What’s an extra few packs of cigarettes—sans the toxic chemicals no less. There is one quote from a homeless woman at the end of this article that should be taken to heart however — not just this week but every week. She says, “they should have made it mandatory that we were off the streets.” Now that would be the *most* beneficial thing to do for their health, but of course “homeless advocates” aren’t really advocating for that. These “activists” will protest anything. The city already spends a quarter of a BILLION dollars on homeless… and it’s never enough. The newly-passed proposition C will double that amount? And what will that do? Provide more salaries for these never-satisfied progressive activists, dump millions more into their unaccountable coffers, and mostly will result in more homeless streaming into the city to take advantage off all the free stuff – free food, free tents, free weed, free housing, free RV parks, lax laws… the list goes on. What we should be protesting about is why, when masks were sold out everywhere else, the city didn’t pass out masks to anyone BUT the homeless — no masks to the much more vulnerable elderly and children. These “activists” will protest anything. Just another example of the city’s common practice of neglecting the needs of the “regular” tax-paying citizens in favor of the select few in the progressives’ protected classes.